This book covers a broad spectrum of issues shaping the current paradigm of minerals sector governance. 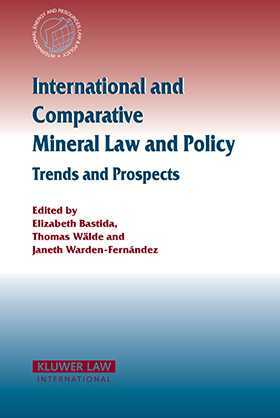 The ultimate aim of the book is to understand trends and developments in mineral law and policy occurring at international, regional, cross-border and in some selected cases at national level and also to identify some of the challenges lying ahead. With these objectives in view, the book brings together a representative selection of the most knowledgeable authors on the subject. The contributions deal with a diverse range of issues tackled from interdisciplinary perspectives. Topics are divided into five main chapters: international and comparative aspects of mineral law; actors and policies in the minerals industry; investment prospects, financial and fiscal issues; sustainable development and regional outlooks. The book aspires to serve as a useful reference for scholars, practitioners, students and all those with an interest in current developments in the areas reviewed. Elizabeth Bastida is the Rio Tinto Research Fellow and the Director of the Mineral Law & Policy Programme at the Centre for Energy, Petroleum, Mineral Law & Policy at the University of Dundee (CEPMLP/Dundee). Thomas Wälde is the Professor of International Economic, Natural Resources and Energy Law and was (until 2001) the Executive Director of CEPMLP/Dundee. He currently runs TWA, his private consultancy firm, which provides advisory services in natural resources and energy law, regulatory reform, investment promotion, state enterprise/agency appraisal and restructuring, privatisation, contract assessment, negotiation and dispute management. Janeth Warden-Fernández is a Research and Teaching Fellow, an advisor of the Mineral Law & Policy Programme and the Manager of the Distance Learning Programme at CEPMLP/Dundee.